As you may have noticed from previous posts, I don't have much in the way of a good workbench. 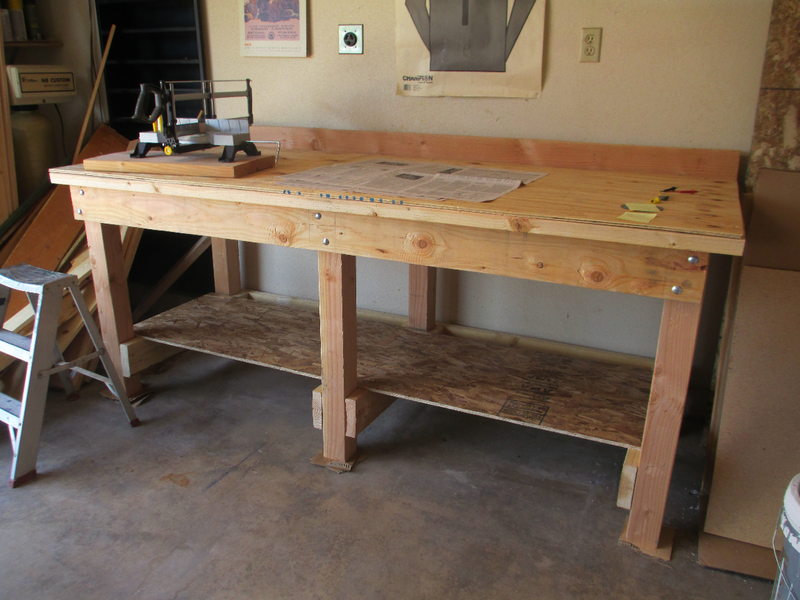 Most of my previous projects have been built either on a poorly constructed (and not even close to level) table that came with the house; or on a piece of wood mounted in two sawhorses. Not the ideal work environment! 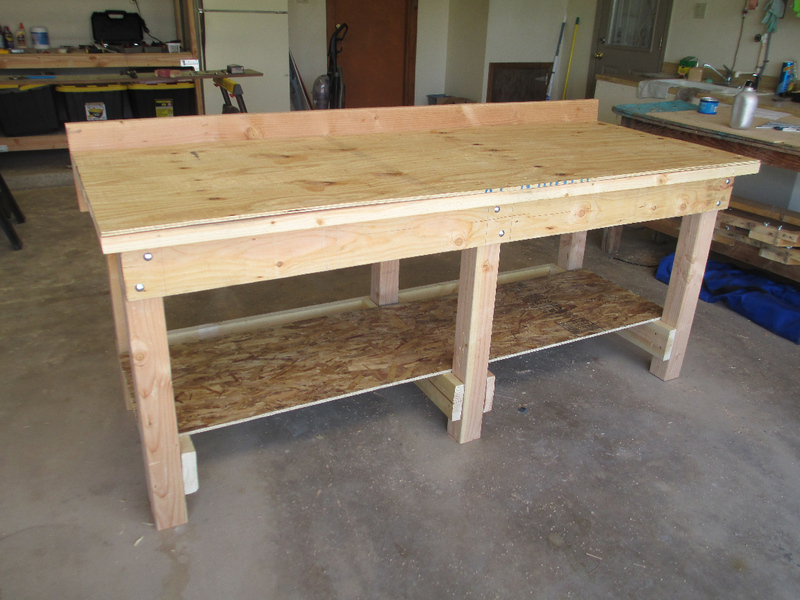 After my previous modular bookshelf project, I decided it was time to build a proper workbench for future projects. This post will detail that effort, and as always, will contain the plans so you can do it too. 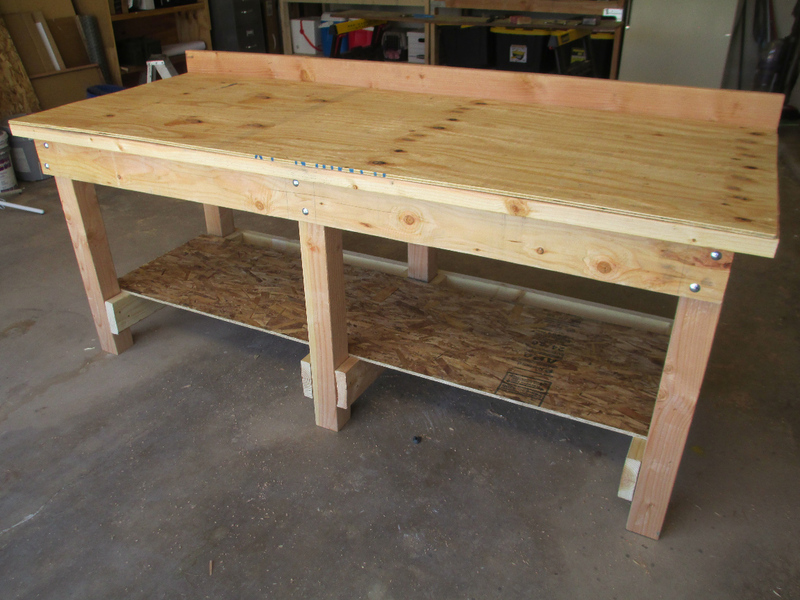 I did some searching and found some free workbench plans by Steve Maxwell. The plans appeared to have everything I wanted, and they were adaptable enough for me to alter them for my own needs and space requirements. 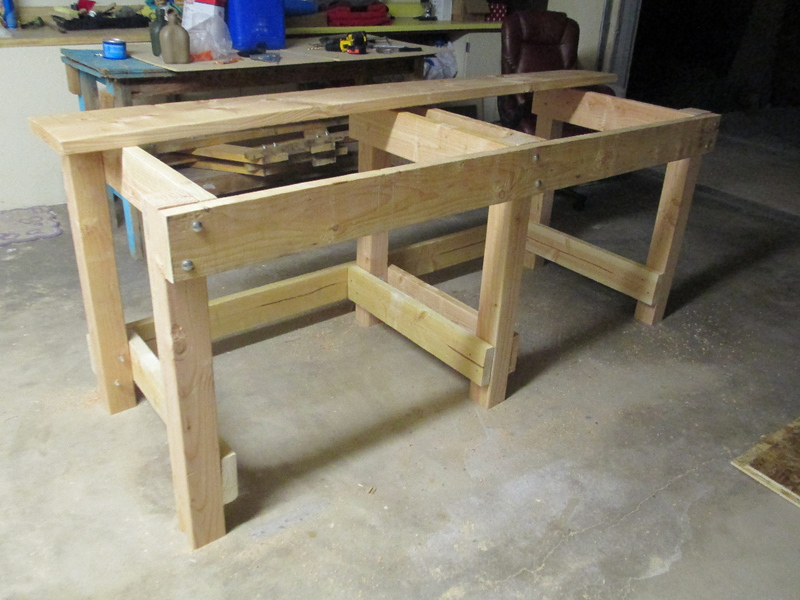 The bench is a very sturdy design, using 4x4s for the legs and 2x6s for the crossmembers and bench surface. Another thing about Steve's plans that I liked was the carriage bolt design, which would allow me to tighten or loosen the legs if necessary. Steve mentions this benefit in his plans as well. 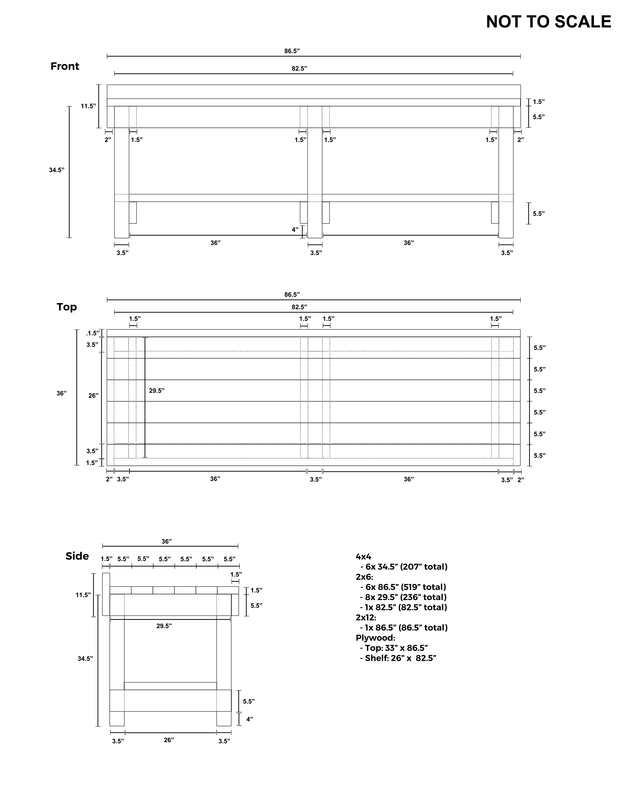 The plans I created for my workbench. I also included the dimensions of lumber required. A drill press - I used a drill press to drill the initial holes in the crossmembers, in an attempt to get them as straight as possible. Cut the wood - obviously done first. Build the legs. There were three sets of legs in the design and I put those together first. I was able to do this solely with clamps, a level and a screwgun. 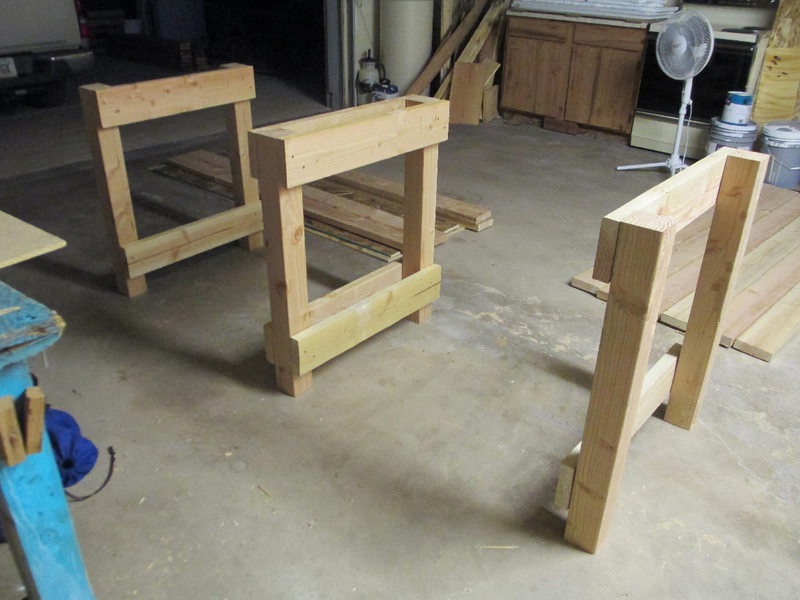 I built the legs first, then stood them up in preparation for clamping the crossmembers on. Because the crossmembers would be connected to the legs using carriage bolts, I needed the holes drilled through the crossmember into the leg to be as square as possible, and I didn't feel I could achieve that level of accuracy with my power drill. So, I took the three crossmembers down to Heatsync Labs and, with the help of a friend, used their drill press to drill the holes. I took the crossmembers back home, clamped them to the legs, then drilled through the crossmember holes into the legs using my power drill. For the most part, things came out even, and I was able to bolt everything together. Two of the three crossmembers bolted together. The third crossmember is the 2x12 resting on the top, almost ready to be clamped and bolted into place. 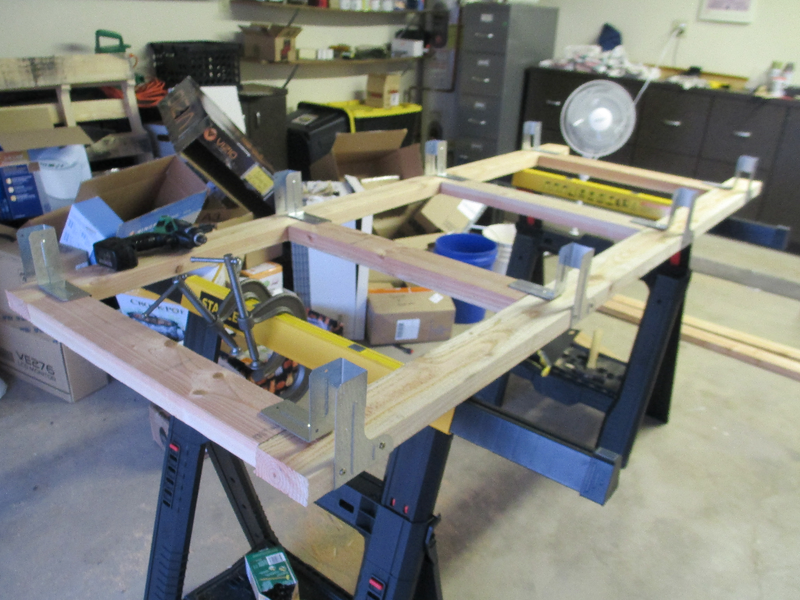 Once I had the frame bolted together, I attached the 2x6 surface beams to the frame, one beam at a time, using lots of clamps to try to get things as level as possible. Finally, I attached the lower shelf and the upper surface cover, both made out of plywood, thereby completing the bench. Following its completion, I moved the bench into place. The bench is not perfectly level and I did need to shim it, though this is more due to the fact that my garage floor is not level! I had a few challenges in building this bench. I'll detail them here for your consideration. Perhaps the most difficult challenge was putting everything together square. Since all the pieces lap, the bench design itself gave me no assistance in squaring everything. In the end, when putting together the legs and the frame, I simply had to clamp everything together, check with a level, and adjust things as needed with a rubber mallet. This challenge was compounded by an uneven garage floor. This ended up taking a long time, but it was worth it in the end - the bench came out pretty darn level. Another challenge was the wood. As you can probably see in the pictures, some (perhaps even most) of the pieces are bowed and warped. When purchasing the wood, I tried to buy the straightest pieces I could from the store; but after only a week sitting in my garage many of these previously straight pieces had started to warp. This hindered my efforts to make the bench flat and square. Why did the previously straight pieces warp? To be honest, because I cheaped out and bought fresh, "wet" lumber. I learned a valuable lesson from this - next time, I'm going to pay a bit extra to get kiln-dried stuff. I suggest you do the same. That wraps up this post. 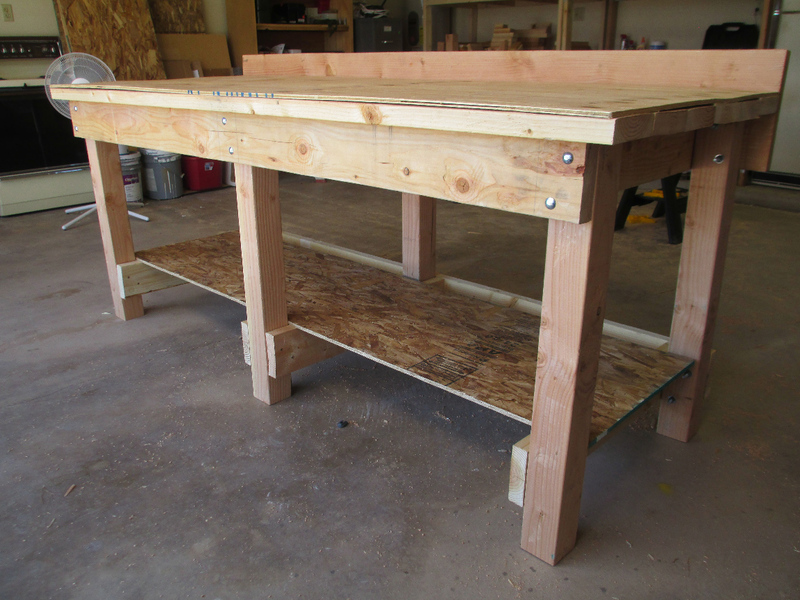 As always, if you're interested in building a workbench like mine, you can find the plans here. Best of luck with all your future projects! As for me, I think my next project is going to be a pegboard to put above the new workbench, and after that, perhaps another set of modular bookshelves. I'm really looking forward to finally having a proper work surface!